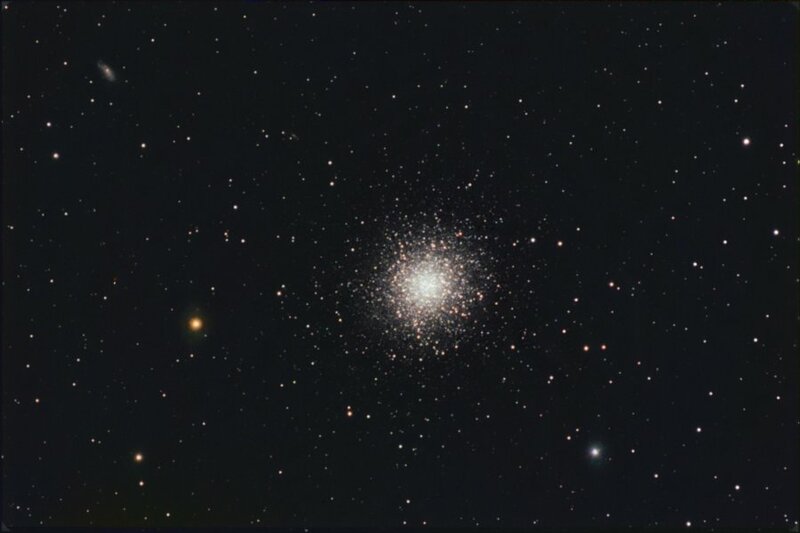 M13 is the showcase globular cluster of the Northern Hemisphere. It is the biggest and brightest of the globulars, at least from our point of view in the Northern Hemisphere, though it is overshadowed in both size and brightness by Omega Centauri in the Southern Hemisphere. It was the target of our own vesion of SETI: in 1974, as part of the dedication of the Arecibo radio telescope, a message was transmitted to M13. M13 packs several hundred thousand stars into a sphere only 145 light-years across. Like most (if not all) globular clusters orbiting the Milky Way, its stars are also very old (about 10 - 12 billion years). This hints that at least for our galaxy, globular clusters are the oldest structures. Recent studies show that this is not the case with other galaxies. M31 for instance, has globular clusters as young as 500 million years! (Source: Robert Gendler). M13 was one of my very first targets when I first tried out astronomical CCD imaging. In fact, it may have been my first target. I've imaged it at least one other time in 2005. Equipment Used: Takahashi FSQ-106N at f/8 with an Extender-Q on a Takahashi EM200 Temma-II mount. SBIG ST-8XE camera with CFW-8a filter wheel and Astrodon filters. Self-guided.